The purpose of the American Red Cross Water Safety Instructor Course is to provide individuals with an awareness of the importance of water safety training and to provide general information about being safe in, on or around the water. Participants will learn to teach individuals of different ages and abilities how to swim. The program covers the knowledge and skills needed for aquatic skill development. Participants will identify and discuss water safety tips that help individuals remain safe in, on or around the water. 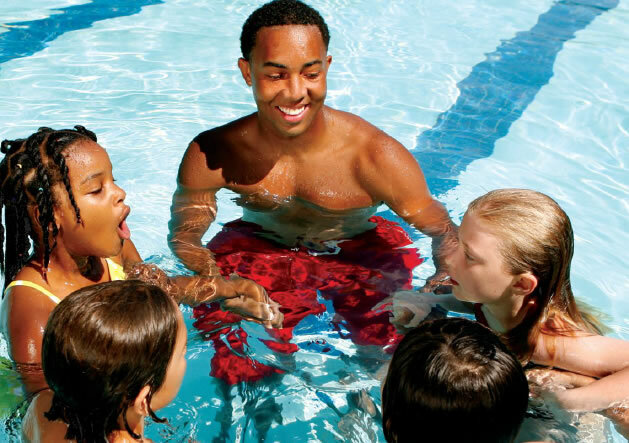 They will identify and discuss water safety tips for specific aquatic environments such as home pools, lakes and rivers, spas and waterparks. 1. Death by drowning is a leading public health problem in all countries. 2. The vast majority of deaths by drowning can be prevented. 3. Everyone, ideally commencing at a young age should have access to training in water safety. 4. Knowledge and understanding of water environments and their associated hazards should be taught to everyone at the earliest possible age. 1. Participants must be at least 16 years of age. 2. Participants must swim the following strokes consistent with the Level 4 Stroke Performance Chart. Front crawl - 25 yards, Back crawl - 25 yards, Breaststroke - 25 yards, Elementary backstroke - 25 yards, Sidestroke - 25 yards and Butterfly - 15 yards. 3. Maintain position on back for 1 minute in deep water (floating or sculling). 4. Tread water for 1 minute.